The secret is the ability to discover, nurture and extract qualities that are unique to Mt Vernon from grape to the final product. This, combined with a true determination to succeed, is what has made Mt Vernon a wine of distinction. 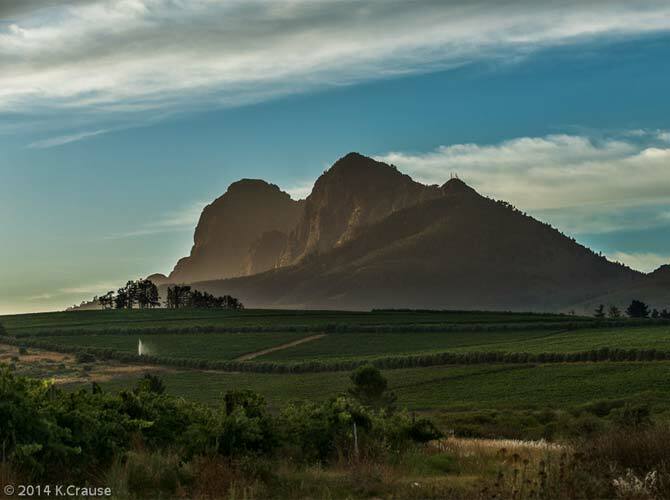 Located near Klapmuts and part of the Simonsberg-Paarl region, Mount Vernon Estate was established in 2003 by David and Debbie Hooper. Under their ownership and management, the estate is producing a range of top single vineyard and estate wines, including a Malbec, quite a rarity in the region. John Hooper their Son is now heavily involved in the marketing and creativity of the Mt Vernon Wine range and is developing and bringing to market innovative new lines. Currently 28 hectares of vines are planted on the 110 hectare farm. Core varietals planted are: Cabernet, Malbec, Merlot, Petit Verdot, Pinotage, Shiraz and Chardonnay. Klapmuts has a warmer climate but receives a cooling breeze from the south on many hot summers days. It is a good area for Shiraz and Cabernet Sauvignon. Aspects of the vineyards vary but are generally northerly and west facing. The name Mt Vernon originates from two sources. Firstly it is the name of George Washington’s home which is situated on a beautiful aspect overlooking the Potomac River, in Virginia, USA. Vernon is also the middle name which has been given to almost every male member of the Hooper family for many generations in memory of Vernon Edward Hooper, a revered patriarch who died in Durban in 1954. The crest of Mt Vernon also has a family connection being the rank insignia of Noel Vernon Hooper who served as a Sergeant Major in an anti tank regiment of the South African Army in North Africa during the Second World War. Opaque with bright, blue/black rim. Penetrating nose lead by plum and blackberry, dark cherry, some chocolate and hint of anise. Rich, deep mouth with developing flavours as promised on the nose. Lively tannins with smooth texture. Good balance. Flavours develop in the glass. Impression of overall softness yet good firm finish. Long, lasting full fruited finish. Spice develops into a major feature the longer in the glass and adds to the overall complexity. This single vineyard wine is appealingly crisp with titillating hints of lemon. Fermented in French oak barrels, it has a gentle wood character which allows the wine to display abundant fresh fruit on the palate. Deep, opaque core with bright, tight blue/purple rim. Very attractive nose with gorgeous, ripe, red berry fruits mingled with toasty, smoky notes. Rich, deep, well flavoured mouth with loads of ripe mulberry, plum and dark cherry flavours. Well balanced with supple tannins and fine acidity. Good structure with smooth texture. Deep purple core with bright, blue/purple rim. Rich, ripe, full fruited nose with attractive cherry, berry, bramble nose. Slight smoky hint with edge of spice. Ripe, full fruited mouth with abundant sweet fruit. Hints of toasty oak with loads of ripe developing flavours. Inspired, creative and passionate, Jean Pierre lives on in this true to character provincial style Rose. Particularly good during lunchtime, with delightful passion fruit flavours upfront, yet crisp and dry on the finish. Deep purple core with a bright inviting rim. A Pinotage with an appealing nose offers ripe berry flavours integrated with wood. The body is well balanced with berry and subtle tannin extracts. Invigorating light golden colour. Crisp Chenin Blanc tones deliver hints of tropical fruit on the nose and palate. A lingering fresh dry aftertaste makes this a superb wine for all occasions. It will go particularly well with spicy food, fresh fish and salads. Full lively palate yet well balanced fruit structure with a semi sweet finish. Delicious when chilled especially with spicy food and meat dishes however fantastic on its own. Lively pink colour with bold tones upfront on the nose. Sweet notes with full mouth sweet berry flavours follow through into the aftertaste with a silky smooth finish. This great South African wine is perfect for those long summer lunches, sundowners or that special moment. Wherever you choose, South South West, internationally, is the wine best suited to complement your lifestyle. Sweet Lips is refreshing, inviting, tasty and seductive. A natural sweet Rose made from the finest quality grapes. Deep and delicious purple tones. Lively yet inviting nose with hints of citrus and cinnamon which carry through to enhance the taste.